I've been commissioned to make a Queen size quilt of a ladies horse, with two shams with the horses head on them. She would like for it to be as realistic as possible so I understand that there will be tons of applique. She wants only the horse, no pieced blocks on moss green background. The picture below isn't the picture I'll be using but it is the horse. We'll be setting up a day for better pictures in the near future. I suppose I could draw this out by hand if I had too. My questions would be..
1. what type of fabric for the horse? 2. where would I get the fabric? 3. is there a program to help with with the applique? I have EQ7 but find it very difficult to draw with. 4. 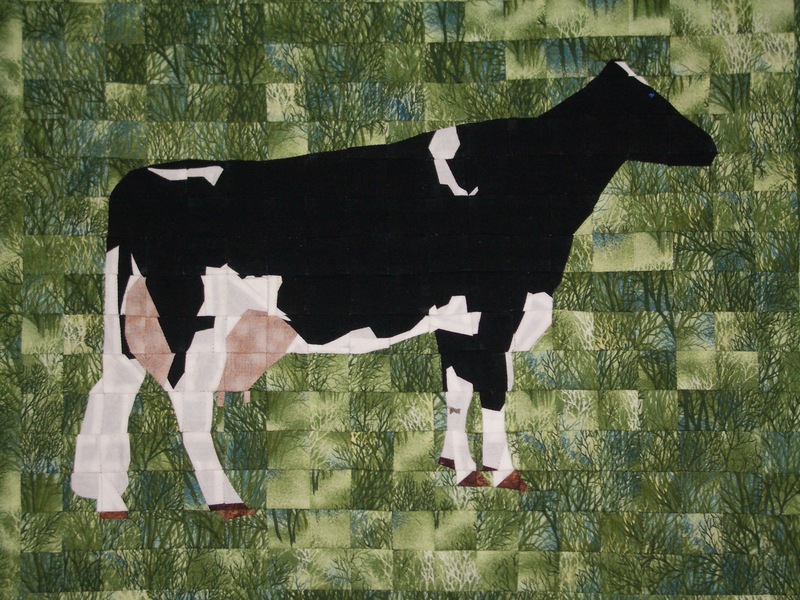 Do you have picture of a horse quilt that you've made that looks realistic? 5. Is there a website or book with information on making a quilt from a photo? Thanks for any help or advice you may have! Last edited by leatheflea; 06-30-2013 at 08:43 AM. I would hand sketch applique by hand & stick to solids or non-distracting fabrics for the applique...I might even consider hand dyed for that brown to get some variation in color. Additionally, I would ask for my client's approval for the final sketch and explain each of the pieces required and the hours already spent on the design. In the approval meeting, I would also provide a small sample of a simple design with an explanation of how long the simple version took so they understand the amount of time required for this project. If you have difficulty drawing realistically by hand, I may have someone I can refer for assistance. I'm thinking raw edge applique with batiks (because they don't fray as much). There is a software that you can upload a photo and it will print out a grid of either mosiac tiles (eg all 1" squares), or as a grid of pieces each shaped to the size of the color block (no two sizes/shapes alike). It is called QuiltedPhoto and you can buy it online here. I have an older version and it is very easy to use. You can choose sizes and shapes of the mosiac tiles (ie 1" square or 2" diamond), the amount of colors you want to pull out, and it will print on standard paper then you piece the pages together. Once you have all of the pages laid out on your wall or table, overlay with something sheer that you can use as a foundation. Lay your applique pieces over the foundation and secure them down (I used a glue stick to lay them out and once I was happy with an area I used clear mono-filament thread to stitch down the edges of each piece - all of my pieces overlapped others). And don't forget ... whatever detail you might lose in the piecing, you can make up for in the quilting. I haven't managed to successfully do this yet, but it is theoretically possible. I have thought of using a photo to cross stitch program to design a watercolor quilt of a sunset over the water. I haven't figured out how to get the resolution right to get a decent conversion. There are some books about doing landscapes, and photos by applique. They involve tracing the photo and tracing changes in color. I'm curious about the same thing, since I'd like to make an applique of my black cat, something other than just a silhouette. 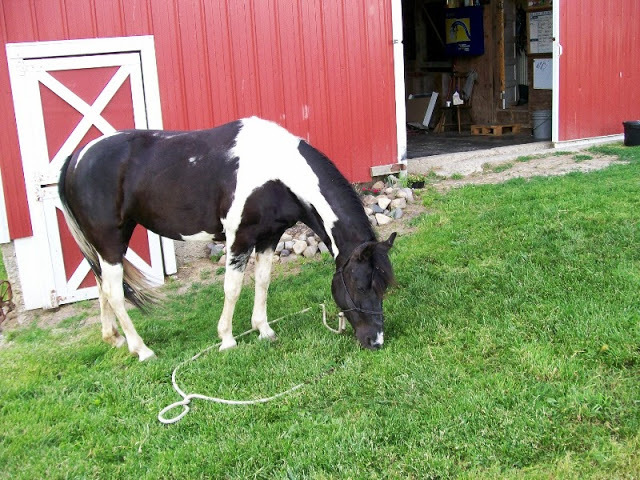 i would see if you can put the horse in a setting like a field or pasture. i did one with a deer in a feild with a creek and sunset sky. applique the deer. came out really nice. i used batiks and love how it came out. it was very easy to work with. i thinknthis might be the easiest and best bet. good luck and post a pic when yu are done. There were patterns out about 4 years ago that you did with batiks. They had a bear, wolf and a horses head? I wonder if the horse head is still available. Is so, you could use that pattern for the pillows and change the colours into the horse in the picture. Toni Whitney does realistic horse quilts with batiks and fusible applique. Queen size?? A horse-only quilt?? I'm sorry, I can not even imagine having a nearly full sized horse standing on my bed, in a quilt or not. How weird. Wouldn't a picture transferred to fabric be the easiest way? Can one do that? Okay, that Tony Whitney stuff is amazing, I agree. My suggestion for designing your own pattern is to convert one copy of your color photograph into black and white. This will allow you to see shading and color/value shifts that are not as obvious in a color photo (at least not as obvious to me!). I have found if I reduce a photo to black and white, then trace it (over a light box or against a bright window) only marking the most obvious color/value shifts it becomes less overwhelming to build a pattern, and I am sure to include the lines that are most critical to the composition. You can always add detail back in through fabric choice (batiks are awesome, and Bug Fabric has a lot of great textural fabrics for doing fur and foliage), embroidery and quilting. It sounds like an awesome project - exciting and challenging, and I hope lucrative for you! And I totally agree with retrogirl02's advice about getting customer approval at several stages: a non-quilter can have no idea about how long this project is going to take, and why it is going to (and should) cost a fair bit of gold. Thank you, you've given some wonderful advice. I'll be trying the black and white photo idea. And yes I'm getting paid VERY well for this one. I told her in advance that it wasn't going to be an easy one to make and we've already agreed upon the pot of gold, half in advance. THanks for the link! Wonderful fabrics! And helps me alot just to see the pictures of the quilts. There will be no cutting fabric until she okays the sketch that's for sure! I just notice you're in IN also! Big cheery wave from Martinsville! This is the way we did this sort of thing in art school. First you need the size of the subject. Next, tape a piece of tracing paper the size of the image on the wall. take a good pic of the subject, animal or human, put the picture into a projector and project the image on the wall onto the paper. You can now trace all the important areas of the subject. Use that tracing to place your applique pieces. After selecting your fabrics to match your subject, iron on pellon interfacing to the wrong side of the fabric, cut out your patterns from you pattern and fuse them to your background. The background should have a tracing of the subject for placement of the patches. most photo programs have a setting for printing the photo as a line drawing. once you print it out you will have the templates for the pieces needed. Check out the websites of some of the major pictorial quilt designers...Cynthia England, Caryl Bryer Fallert, Kathy McNeil, and maybe take the Craftsy class to give you some ideas on technique (I know nothing about what the class covers or how good it is). and there's one by Marcia Stein, too. ohhh I just had an idea!!! when you are going to get ready to cut out the fabrics trace a pic of the horse and then project it on the wall to the size that you want and then trace it out on the fabric the way that you want it to be. and you can even have the lady look at the fabric with the horse on it with the projector on. this way she can get an idea of what it will look like and size wise. my mom used to do this with paintings and murals. worked wonderfully. But that is if you can get your hands on a projector. I think that we all would love to see a pic of the finished quilt and i would love to see some of the steps that you are taking. Wow! You all have wonderful ideas! Thank you so much! I'll be sure to keep you posted on this quilt. It won't get underway for about another week or two. i love the cow and fabrics. good job on it. She wants the full horse on the quilt with no landscape in the background just solid background fabric, and the horse head on the shams. Working on commission is all about pleasing the customer. She loves her horse, she said she loves her girls eyes. If anything will give me a problem that might be it. Nope I've never tried to make a quilt in the likeness of a live subject. I don't believe in tossing in the towel before even trying. 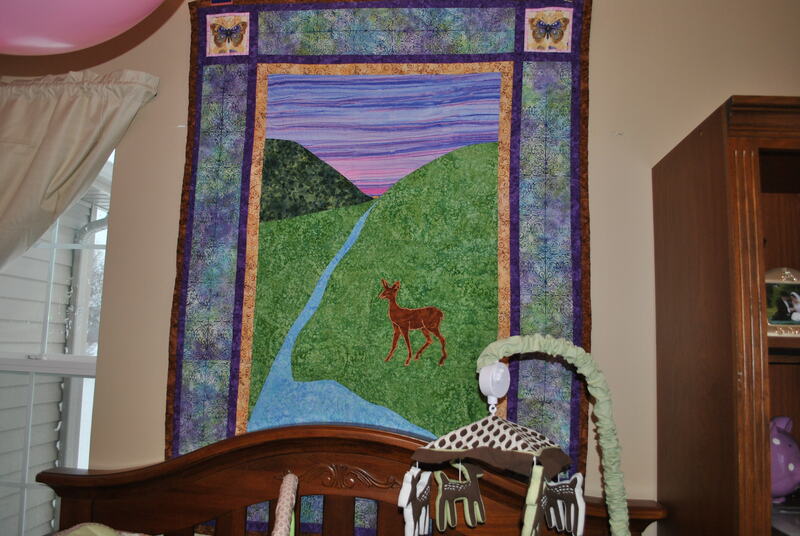 I have however made many appliqued quilts using various styles of applique. It's not on my list of must makes either, but its on her must have list. I quoted her a price and was sure she would say no thank you! but she said yes I'll pay more if needed! It'll be an adventure, who knows where the adventure may lead. All in all I just want to make her happy and make money in return. QuiltE, Love your cow! I'm a sucker for cows, they are so cute. I know it sounds silly but we feed our neighbors cows, we've given them all names, when they here our 4 wheeler they come running, it just cracks me up! Most people don't think they have personalities but they do. So did you use a program to help you design the cow? All I can say is Good Luck! I know someone member has the information to help you with this but that isn't me. beautiful horse!